This article is an attempt to summarize my studies on the ancient Indian texts like the Vedas, the epics and the Puranas, focusing on their sizes and other aspects of these texts, like their ages, purpose and significance to ancient Indian people. The four Vedas viz. Rig-Veda, Atharva-Veda, Yajur-Veda and Sama-Veda, the two epics viz. Mahabharata and Ramayana, the 18 major Puranas and some minor Puranas are compared in this article. 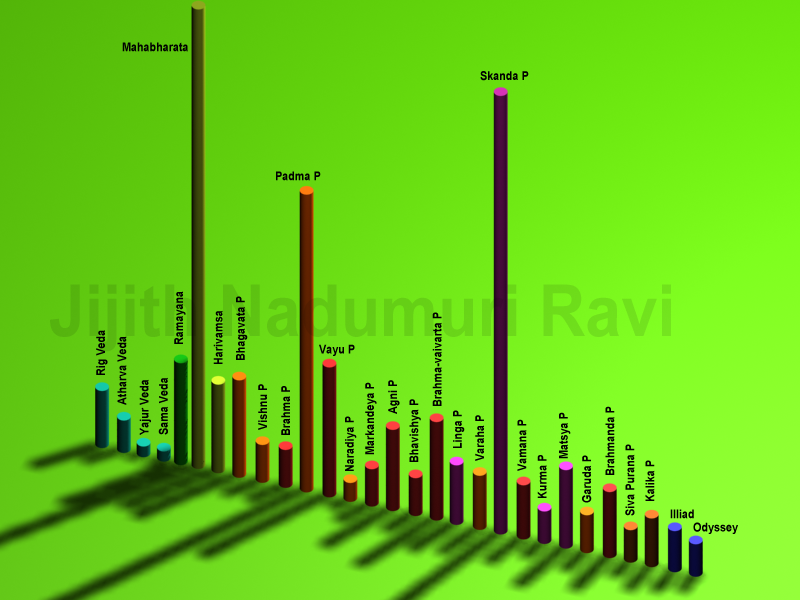 Comparative sizes of ancient Indian texts based on the number of verses contained in them. Height of the cylinders are in proportion to the number of verses contained in each texts. The four Vedas, the two epics, the 18 Puranas and a few minor Puranas are compared. Illiad and Odyssey of Homer too is compared. In the comparison below, the number of verses in each text is proportional to the radius of the representative spheres. The Vedas are four in number. Based on the order of composition, they are the Rig Veda, Atharva Veda, Yajur Veda and Sama Veda. Popular view is that the Atharva Veda is the last among the four Vedas. I consider this a misconception of Indic studies conducted by the 19th century English scholars who learned Sanskrit and analyzed these texts. Rig Vedic verses are found in Atharva Veda (20%), Yajur Veda (25%) and Sama Veda (80% to 90%). Hence Rig Veda is obviously the oldest among them. Verses from Atharva Veda is found in Yajur Veda (5%). Hence I consider Atharva to be older than Yajur Veda. With its verses dealing with personal well being, magical spells and charms, Atharva Veda represent a parallel religion that existed side by side with the religion expounded by Rig Veda which centered around the worship of Vedic gods like Varuna, Agni, Indra and Vishnu. The religion of Atharva Veda is similar to the Shaman religions of the world, where as the religion of Rig Veda started as nature worship and advanced into high philosophy involving abstract concepts on the cosmic reality. Both these religions never worshiped idols or created altars to worship god. Worship of god was an individual activity in Rig Vedic religion, while in the Atharva Vedic religion it was sometimes an individual activity and sometimes a family activity. Yajur Veda started as a spin off from Rig Veda. By this time, sacrificial altars (Yajna-vedi) were created and worship of god became a community activity. A priest class emerged whose duty was to officiate in sacrifices (Yagas, Yaj-nas) involving large number of people. Rig Vedic verses were used as recitations in these sacrifices. Thus Yajur Veda was born. In later stages these sacrifices became more sophisticated and there were also special people to sing the Rig Vedic songs in melodious tunes. This was especially true for Soma sacrifices. Thus Sama Veda was born. It was nothing but musical recitation of Rig Vedic hymns. It is a tendency of AIT/ AMT theorists to compress the time-frame of the Vedas, the epics and the Puranas into absurdly brief durations, to suite their theories and their preconceived notions about a foreign Aryan origin of the Indian civilization. Thus they say that Rig Veda is created around 1500 BC and other Vedas were created subsequently, considering Atharva Veda to be the last. They place Mahabharata at 900 BC and Ramayana at 500 BC and the Puranas between 400 BC to 400 AD. This they do without substantiating their arbitrary dates with any valid reasons. Mostly these dates arose from the 19th century notion that the world was created around 4000 BC and nothing existed beyond that period. My view, shared by many researchers is that Rig Veda is from an era when river Saraswati was a mighty Himalayan river, that ran parallel to river Sindhu (Indus), taking the waters from the melting Himalayan glaciers to Arabian Sea. This was the case during 10,000 BC to 5000 BC. By 10,000 BC the last Ice Age ended. Himalayan glaciers melted and the water was carried away from Himalays to the sea by mighty rivers like Saraswati, Sindhu and Ganga and their tributaries Satadru, Vipasa, Vitastha, Iravati, Chandrabhaga and Yamuna. Saraswati river flow was at its peak during 8000 BC to 4000 BC. I guess the society that generated the core of Rig Veda was from this era (starting since 10,000 BC and reaching its peak during 8000 BC to 4000 BC period). The mythological attribution of Indra slaying Vritra, thereby releasing the waters locked up by the magic of Vritra is a reference to the geological epoch of the melting of glaciers after the last Ice Age and subsequent release of waters from these glaciers. Indra's mount (mythological or real) was an elephant called Airavata. It was mentioned as having four tusks, taller than an ordinary elephant and lighter in color. This could be some mammoth that became extinct soon after the last Ice age. This elephant was called Airavata since its native land was a region named Airavata. There were two regions with the name Airavata. One is the region around river Iravati (Ravi_River) identifiable with Punjab and Himachal_Pradesh. Another region is in the far north identifiable to regions as far north as Siberia. Based on the descriptions in Rig Veda, we can conclude that events mentioned in Rig Veda occurred in the regions around river Iravati in Punjab and Himachal Pradesh. It is mentioned in Mahabharata that during the period of Samvarana, the father of Kuru (the founder of the Kuru dynasty) the whole earth was filled with sacrificial altars. Samvarana is also mentioned as living on the banks of river Sindhu. This could be the era of Yajur Veda. Ramayana also mention about sacrifices (Yagas, Yajnas) and use of altars in sacrifices like Putrakameshti. Thus the Yajur Vedic era predates the period of Ramayana and also the core events (life of Kuru-Pandavas) mentioned in Mahabharata. I consider Yajur Vedic era to be around 6000 BC to 4000 BC. During the same period, especially towards the end of this period, Sama Veda too was born. Atharva Veda was (older than or) as old as Rig Veda and continued its development. I consider Ramayana to be of the same period (6000 BC to 5000 BC), with the core events (life of Rama and Ravana) happening around 5000 BC. During the events mentioned in Mahabharata and before the occurrence of core events (Kurukshetra War) , Saraswati river dried up and it was no longer a mighty perennial river. Drying up happened since 3500 BC. This is mentioned in Mahabharata, Shalya Parva. Here Balarama, the brother of Krishna is mentioned as travelling along the partially dried up Saraswati river. Thus I consider Mahabharata to be of 3000 BC period. There are 18 major Puranas and several minor Puranas like Siva Purana and Kalika Purana. Some Puranas like Garuda Purana, Matsya Purana, Bhargava Purana, Varuna Purana, Vasistha Purana and Parasara Purana originated before or during the period of Mahabharata and got embedded into Mahabharata. Some other Puranas like Bhagavata Purana, Vishnu Purana, Bhavishya Purana etc were created after Mahabharata. All of them, were continuously updated during later periods by which they grew in size. Some like Bhavishya Purana were updated to even recent times like 1700 AD. Hence the Purana era can be considered as starting from 4000 BC to 1700 AD. This long time period (of around 6000 years) allowed some of them like Padma Purana (55,000 verses) and Skanda Purana (81,100 verses; considering all the fragments and versions in northern and southern India, claiming to be Skanda Purana) to grow into enormous sizes. One may argue that Rig Veda of 10,000 verses took 5,000 years to develop. But we should also consider the human population in those periods. During early ages human population was very less and as time advanced it grew larger and larger, some times doubling in size. Hence there were fewer people to develop Rig Veda and more people to develop the Puranas. Thus the total size of all the Puranas (minor and major) will come to around 400,000 to 500,000 verses. That is 4 to 5 times the size of Mahabharata! 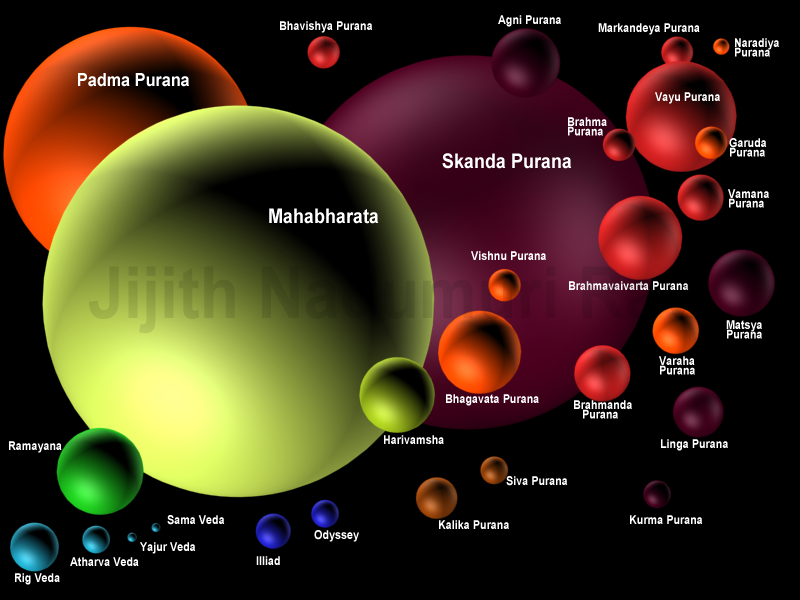 Adding up all the 18 Maha-Puranas we have around 300,000 verses, 3 times the size of Mahabharata. The four Vedas together with the epic Ramayana will be only half the size of Mahabharata. The dates (in relation to the sizes of the texts) are reasonable if we compare them with the two Greek epics Illiad (7600 verses, size comparable to Vishnu Purana of 7000 verses) and Odyssey (6000 verses) which describe events occurred during a period of 2000 BC to 1000 BC in and around Greece. During the Puranic Age, idol worship became prominent. Religion also became sectarian with various sects worshiping Vishnu, Siva and Brahma as the primary God. There were also sects worshiping Skanda in the form of Kumara and Kartikeya in northern India and as Subrahmanya and Muruka in southern India. Worship of Goddess Durga in the form of Uma, Parvati, Maheswari and Kaali also emerged. In later stages worship of Ganesha as Ganapati, Vinayaka and as Pillayar (in South India) too originated. Similarly worship of Dattatreya as well as Sastha or Ayyappa too originated in central (Maharashtra) and southern India (Kerala) respectively. Some Puranas were dedicated to each of these sects. The 18 Maha-Puranas were divided into three groups each dedicated to one of the trinity Gods viz. Vishnu, Siva and Brahma. These sects might have co-existed during Vedic era but they gained strength during the post-Vedic, post-Epic Age aka the Puranic Age. Ramayana and Mahabharata are the two epics of ancient India. Ramayana contains 18,000 to 24,000 verses depending on the version. Popular version with 7 Kandas or books (including Uttara Kanda) contains 18,836 verses spanning 606 chapters. Mahabharata contains 84,879 verses spanning 2105 chapters in its 18 Parvas or books. Usually Harivamsha an appendix of Mahabharata is also considered as part of Mahabharata. Harivamsha contains 16374 verses and three more Parvas. Taken together Mahabharata thus contains 101,253 verses and 21 Parvas. Ramayana and Mahabharata were continuously updated with new information till 400 AD. The version of Ramayana available today though has a language of later Sanskrit. This might have resulted in the popular misconception that Ramayana was later to Mahabharata, a notion especially held by AIT / AMT theorists. They did this because of their pre-conceived notion that the Aryans migrated to India from west to east. This will require Ramayana that centered around the eastern city of Ayodhya to be later to Mahabharata that centered around the western city of Hastinapura. Popular Indian belief correctly places Ramayana earlier to Mahabharata. Assuming Ramayana-era to be later to Mahabharata-era based on the nature of Sanskrit language used in the composition of Ramayana is a weak hypothesis. If Ramayana events occurred later to Mahabharata events, then Ramayana should contain at least a passing reference to Kurukshetra War occurred between the Kauravas and Pandavas which is the core event mentioned in Mahabharata. We find nothing of that sorts in Ramayana. On the contrary, we have the history of Rama mentioned in Mahabharata ( many times. At Mbh.3.99 we have it narrated by sage Lomasa in a few verses. At Mbh.3.146 it is narrated by Hanuman. This narration is more than one chapter long. At Mbh.3.272 it is narrated by sage Markandeya. This is 18 chapters long and the longest narration of Ramayana in Mahabharata. There are also more than five passing references of Rama, Sita, Ravana and Ramayana in Book numbers 1, 3, 4, 7 and 18. While many of these can be considered as later additions not all of them can be dismissed as such. One should also then need to explain why history of Rama or Ramayana should be repeated in Mahabharata more than one times. Even if we dismiss all of these as later additions, the absence of mention of any Mahabharata-events in Ramayana undoubtably proves that Mahabharata Era was subsequent to Ramayana Era. It is also possible that some Valmiki in the lineage of the original Valmiki (who authored the initial version of Ramayana) did some re-rendering of the epic in recent times (or after Mahabharata era). Probably the current version of Ramayana belong to this re-rendering. This is also adding to the confusion of Ramayana's precedence to Mahabharata. Various ways of reckoning Yugas originated at various periods in prehistory. Some definition consider Yugas to be cyclic and some consider it non-cyclic. Some linked Yugas with the conditions of human society, its progress and its decline, resulting into non-cyclic Yugas. Some linked Yugas with cyclic phenomena like the planetary alignments, with duration of a Yuga ranging from 1 year to 100,000 plus years. Tradition holds that Ramayana occurred in Treta Yuga and Mahabharata in Dwapara Yuga. Counting backwards from Kali Yuga, Dwapara-Yuga is the second Yuga and Treta-Yuga the third and Krita Yuga (also known as Rta Yuga, Satya Yuga and Adi Yuga) the oldest Yuga. Hence tradition also holds that Ramayana Era occurred first and Mahabharata Era occurred after that. We can roughly consider Dwapara Yuga to be 5000 BC to 3000 BC and Treta Yuga to be 8000 BC to 5000 BC. Krita Yuga can be considered to be between 12,000 BC to 8000 BC. Why the duration of Yugas are to be increased as we go deeper into past? The Yuga system assumes the point of view of somebody (some ancient historian, like Vyasa and Valmiki) looking into past standing in Kali Yuga, somewhere at 2500 BC. Such a person will know very less about the events happened in the remote past such as between 12,000 BC to 8,000 BC, but more about events happened between 8,000 BC to 5,000 BC and even more about events happened between 5000 BC and 3000 BC. This is a non-cyclic Yuga system based upon parameters of human society, such as its complexity, progress and decline. Division of Yugas in this manner probably originated during the life of Parikshit the grandson of Arjuna. Kurukshetra war occurred towards the end of Dwapara Yuga. After 36 years since this war the Yadava war broke out in Dwaraka. Arjuna was then defeated by tribes like Abhiras and the rule of the Pandavas ended. Parikshit was the new ruler of Hastinapura. He had to face stiff resistance from a foe named Kali, probably a king of Gandhara belonging to the Gandharva tribe. Parikshit temporarily prevented the advancement of Kali into the Kuru Panchala kingdoms. This conflict continued during the time of Parikshit's son Janamejaya too, who seemed to have had a major victory over Gandhara as he conquered the Gandhara city named Takshasila. After Janamejaya, his son Satanika and his grandson too ruled. By this time Kali and his allies like the Airavata-Nagas and Abhiras overpowered the Kurus, Panchalas and other tribes of Indo-Gangatic plain. This age was thus a dark age for these people. They termed it the Kali age. This age started during the reign of Parikshit when Kali first appeared as a major power and as a major threat to kingdoms of Indo Gangatic plain. During the time of sage Saunaka and Ugrasrava Sauti the Kali age was prevailing as revealed by the opening chapters of Mahabharata. Ugrasrava Sauti is mentioned as narrating the history of Bharata kings formerly narrated by Vaishampayana to Janamejaya, while Saunaka and other sages were assembled in a deep forest (Naimisha) which was probably beyond the territories of Kali and thus beyond his control. It is not clear what is the time gap between the Saunaka and Janamejaya. It could be less than 500 years as the reign of Kali and his successors won't have lasted more than 500 years. However the reign of the tribes allied with Kali and their successors might have lasted for a 1000 years. After some centuries, the duration of Yugas started to be counted differently due to the advent of astronomy as the calculations were linked with planetary positions that occurs once in 100,000 years or more. All the four Yugas were then simply redefined to be of the order of 100,000 years. The idea of cyclic nature of Yugas (Krita-Treta-Dwapara-Kali and then Krita back again) too had its origin in astronomy. These were purely mathematical exercises with not much historical or geographical significance. The result was that Kali Yuga never ended, and the traditions consider that we are still in Kali Yuga!